Walking is the action, and slowly is the adverb. Or an adjective (descriptive word). Little being the adjective, and extremely the adverb. Time and time again I’ve seen people give writing advice that forbids the use of adverbs entirely. I’m not one for writing rules, because every book and every author are different and have their own unique voice, so instead of forbidding adverbs let’s take a closer look at why they so often end up on the no-no list. Pacing is really important in stories, but pacing isn’t all about where your action scenes are and how pithy your dialogue is. Pacing has as much to do with the words you use and the length of your sentences. If you are padding your sentences with adverbs, then no matter what is happening the pace will feel slower. Let’s look at an example. Which one has a more visceral meaning? Which one is giving you a better feel for the scene you are reading/writing? No matter what you are writing you should always strive for the strongest words you can, words that do the most work with the least number of letters. Especially if you are writing a short story. But just because you are writing a novel doesn’t mean you can afford to be sloppy. Adverbs of degree are the worst of the lot. Very. Extremely. Pretty. When you are using an adverb to describe a descriptive word, or further qualify a verb or even another adverb, then you probably have the wrong words in the first place. So these are almost always unnecessary padding. Here the adverb is being used to describe just how little the plant is, but then instead of little we could use another adjective that gets across “extremely little” such as “tiny” or “minuscule”. Very is another adverb of degree. Very big. Very fast. Very strong. Pick another word instead. Such as: Huge. Swift. Powerful. These words hold a lot more value even though they mean the same thing. Huge is somehow bigger and more imposing than very big. In swift you can hear the rush of the wind entirely lacking in very fast. And powerful has a force nowhere to be found in very strong. So whenever you see these words, get rid of them. Find a better word to use in their place. Just like in our earlier discussion about dialogue attributions (HERE), there are some adverbs that are an entirely redundant waste of space. Check out the dialogue attribution discussion to see how dialogue itself makes many adverbular (totes a word) dialogue tags redundant. But they can often be just as redundant in the bulk of your prose. And just as sneaky. We’ve talked about why you shouldn’t write ‘walked slowly’ but it’s a much more heinous crime to ‘creep slowly’ because how else does one creep. You never need to whisper quietly. Or run quickly. In fact the only time an adverb might be necessary in this situation is if the opposite is true. Is you character running slowly for some reason (as through magical jelly). Or whispering loudly (which would tell us something interesting about the character in question). But in both of this examples there are other ways to write them that give a clearer and more interesting picture. Which just makes it sound like he’s a really terrible runner, in which case run probably isn’t the word you were after in the first place. ‘Quiet,’ Charles whispered, loud enough that his voice carried to the end of the room. This line not only tells us that Charles said “quiet” but it also tells us something important about his character. He’s one of those loud, confident people who can’t whisper for love or money. So, can I EVER use them? Well… yes. 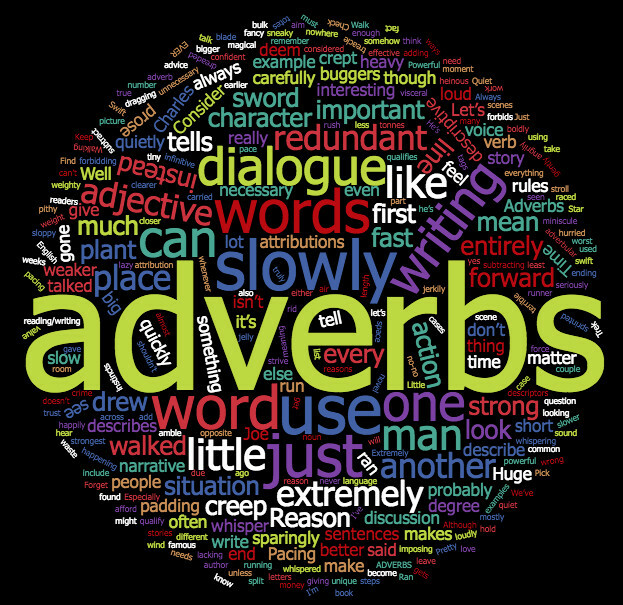 Adverbs, like everything else, have a place in narrative. But like the fancy dialogue attributions we talked about a couple of weeks ago, the more you use them the weaker they become. (And the weaker they make your story due to the reasons above). Each and every one of them needs to be carefully considered (‘carefully’ is an adverb here, and in this situation I deem it to be adding weight, not subtracting it). Keep those you deem truly necessary, those that add, not subtract. But remember that while you can use them you must use them sparingly. (Again, sparingly is an adverb). I don’t think so. And this is why I don’t like writing rules. Always aim for strong prose, but trust your instincts.